Mallum is Sri Lanka’s answer to a salad. 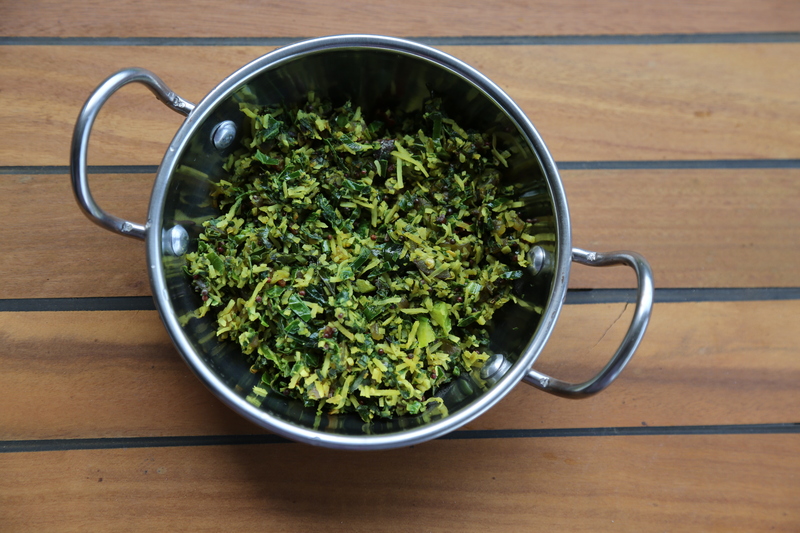 A bevy of greens wilted, spiced and combined with shredded coconut amongst other wonderful spices. It’s often served as a condiment, an addendum to a meal. Something to add flavour, colour and vivid green health. When I made this, I used silver beet and some outer leaves of cabbage from my parent’s garden. Green spinach, kale, collard greens are all easily used. The trick to this is to slice the greens as finely as possible. It’s a skill I lack so, like me, do the best you can. Finely slice the greens. I find rolling them tightly into a cigar shape and using a sharp knife is the easiest way to get a fine slice. In a small frypan add the oil. When hot, add the curry leaves, mustard seeds and onion. Fry until the onion is soft. Add the chopped greens and cook until just wilted. Now add the coconut, mustard seeds, turmeric and salt, Mix well until just warmed through. Serve warm with fluffy white rice.